Receiving this DVD in the mail completes a journey that started for me in 1988. As I have mentioned in a previous article found here, missing Doctor Who episodes have always been an interest for me and although The Ambassadors of Death was not technically missing, all the episodes were always present, it had been missing it’s color with the exception of Episode 1. This story has always been a favorite of mine and I will explain why but the release of this story on DVD is something I have been waiting for a long time to see. If you were a fan living in the UK in 1970 when this story was originally broadcast, it may have been a shock. As a Doctor Who fan in those years perhaps you were already being tested by the dramatic format change. Jon Pertwee just took over the role of Doctor Who, the series was now being made in color and the series was now set on Earth. The Doctor was now working in an unofficial capacity as a scientific advisor to UNIT which was introduced in the previous season with the story, The Invasion. There is a lot of change to take in. I have to admit, between 2006-2011 I watched every single story in broadcast order and when I got to the Jon Pertwee era it threw me for a loop. The funny thing is I have watched these stories so many times that it shouldn’t have made any difference but the format change was actually pretty shocking when I went from the Patrick Troughton episodes to the Jon Pertwee episodes. Thinking about it in those terms, The Ambassadors of Death must have been really shocking. The story itself is pretty simple. Mars Probe 7 and its crew have been stranded in space. Another vessel has been sent up to rescue them, if they are still alive. No one knows for sure. When Astronaut Van Lyden in his vessel reaches Mars Probe 7 everything goes haywire. There is some loud noise that is resonated back to Earth. Everyone thinks it’s feedback but the Doctor knows it is a message. I don’t know of any other story that starts out so confidently. In fact the whole production is like nothing I had seen before in Doctor Who. Right from the start, the title sequence fades out and gives us a teaser before we are smacked with the title of the story. The Space Agency’s control room is a brilliant design. It looks like it is made of metal with various computer and work stations. It is a multi-level set that even has a small lift in it. To me, nothing on that set looks like 1970s. It’s futuristic and bold. The set is not overly lit and conveys a tense work area for the agency. It is simply a triumph. Episode 1 is probably my favorite of the lot and it is mainly due to all of the different sets. There are a lot of dark and gloomy rooms where unknown things are happening. Shadows are casted on people sometimes to obscure their faces. It is very cloak & dagger. As some of those scenes are very claustrophobic, suddenly the story bursts wide open. One of the capsules in space returns to Earth and UNIT needs to go pick it up. Things get more mysterious as there are other people who want that capsule. UNIT sets up a convoy to pick up the capsule in some English countryside but they are attacked. Other soldiers come out of nowhere with motorbikes and even a helicopter! They are all wearing these strangely cool goggles and are firing on the UNIT men with futuristic guns while UNIT themselves are defending themselves in a more traditional way. In the past in this series, we have seen the contemporary military fight against War Machines and the Yeti. 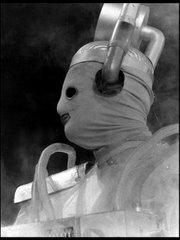 After UNIT was formed, we saw them fight against Cybermen and then Autons but we had not seen them fight other humans. What was happening to our series? This is why I think this story is so good. This is a wonderful fusion of espionage and monsters. It’s about one part of the government misdirecting the other. It’s about secret meetings in government offices, strange scientific experiments taking place in secret underground locations, sabotage and murder. This isn’t William Hartnell’s Doctor Who and that is OK. Season 7 had proven that Doctor Who is about change. When William Hartnell regenerated into Patrick Troughton it showed the series could survive a lead actor change. When Doctor Who came back for Season 7, it showed that it could handle anything. 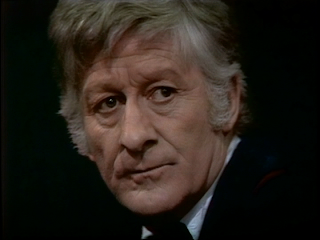 Based on some of the comments from the DVD extra called Tomorrow’s Times: The Third Doctor, critics were excited about the new lease on life that a new Doctor and format brought to the series. It was thought for a while that Doctor Who was going to end when Season 6 came to a close. Patrick Troughton was ready to move on and it seemed like a natural end to the series. Other series were looked at to replace Doctor Who. 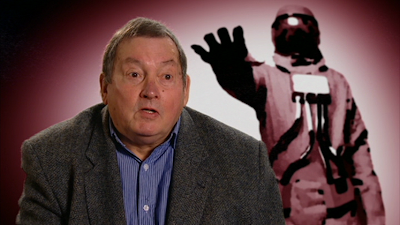 This included reaching out to Nigel Kneale to create a regular series based on his famous creation Quatermass. Nigel Kneale wanted nothing to do with that and it was decided to return Doctor Who for another year. 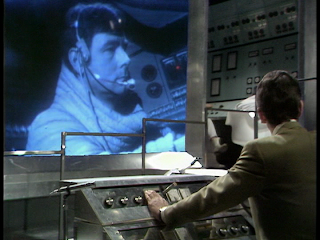 Producer Derrick Sherwin certainly “stole” aspects of the Quatermass story when coming up with the new format. Clearly, the new Doctor working with UNIT is sort of a Quatermass-like relationship. As I mentioned above, I think the story on a whole succeeds in every way. I know a lot of people think stories that are 6 episodes or longer can have padding but I don’t mind it here. Sure, there is a ton of going back and forth and escapes and being re-caught but it’s fascinating to me. The locations are tremendous from English countryside to gushing river rapids. The entrance to the Space Agency is just super cool. The only effect that is a letdown for me is the rocket launch when the Doctor is trying to rendezvous with the capsule still in space. That model shot of the rocking flying off is pretty crap but everything else, to me, is sublime. Along with the regular cast, all the supporting cast is great which obviously adds a lot to this story. Ronald Allen as Ralph Cornish is perfect for the role he is playing. It took me years to realize he was Rago in The Dominators. I guess that’s why they are called actors. Robert Cawdron as Taltalian is enjoyable. Sure his accent changes throughout the story but the character is a fool anyway and gets what he deserves. Highlight performances include John Abineri as General Carrington. He may look like it on the surface but he is not a one dimensional character. His character is one of the great rewards of watching this story all the way through. William Dysart as Reegan is a charming yet thuggish villain. He plays it cool and calm; he is very memorable. Finally, there is Michael Wisher who gets his first role on Doctor Who. He plays a very calm news correspondent John Wakefield who speaks to us, the viewers, to help move some of the narrative along. He later becomes the creator of the Daleks, Terry Nation in Genesi….oops I mean Davros in Genesis of the Daleks. Now, why did I mention 1988 at the beginning of this article? Watching Doctor Who in the Twin Cities in the 1980s was great. Our local PBS station, KTCA, would get the new episodes generally when available and when the Jon Pertwee package of episodes became available they bought it. Up to that point, KTCA only ran the Tom Baker and Peter Davison stories. 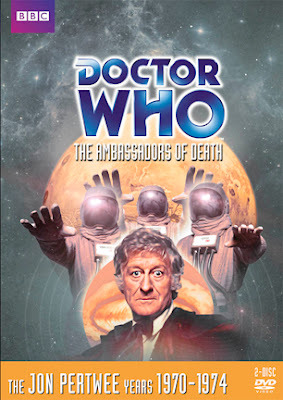 When I found out that KTCA picked up the Jon Pertwee stories, I assumed at 11 years old that this is as far back as I will ever see of Doctor Who. I couldn’t imagine that I would ever see the earlier two Doctors. Anyway, the first story shown was Spearhead from Space which was in color followed up by Doctor Who and the Silurians and The Amabassdors of Death shown in black & white. When those two stories ran, there was a little caption at the bottom of the screen added by KTCA basically saying (and I’m paraphrasing) “Ain’t our fault it’s in Black and White! It came to us this way.” Being a curious Greg I immediately wondered why they made these in black and white. 1988 was a big year for me. One of the highlights was finding the underground network of fans that had rare recordings of stuff not readily available. 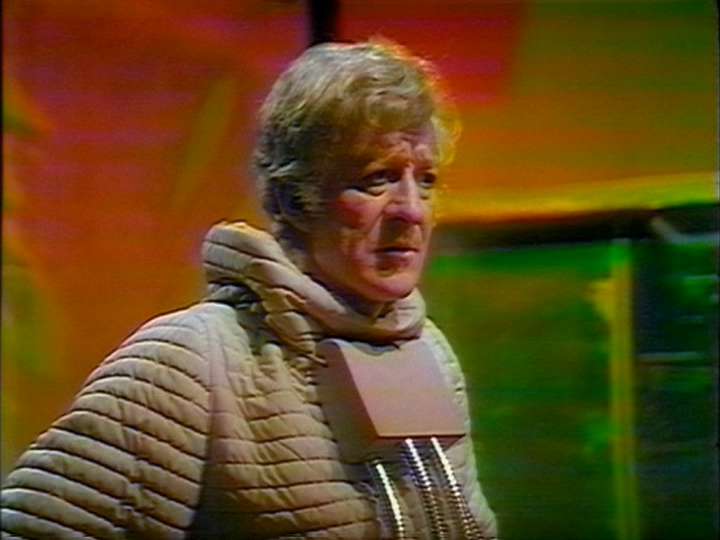 I plan on writing a column about this world in November but it was at that point I learned that the Jon Pertwee episodes I saw on TV in black and white were actually made in color. Even more shocking to me was that I could have color copies of episode that were only shown on TV in black and white. The Ambassadors of Death was one of them but at a price. These color copies came from people who recorded these episodes in the 1970s in the US. To learn more of the why color episodes were shown in the US in the 1970s but not 1980s, please go here where I go into more detail. Suffice to say, the only color copy in existence was recorded off of WNED in Buffalo in the late 1970s. There is a problem though. Somehow when the story was recorded, something happened when it was recorded or with the transmission but over many of these episodes there was some kind of bizarre rainbow patterning. This made a full color version of The Ambassadors of Death nearly impossible. 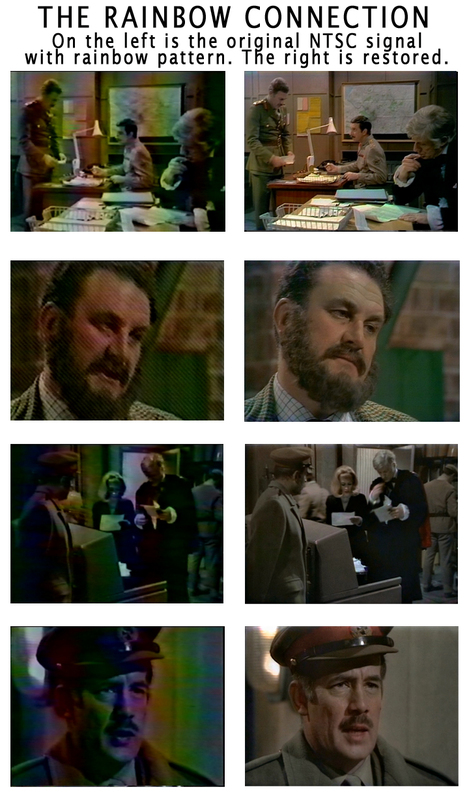 In the 1990s, the NTSC signal of these color recordings were combined with the black & white film to create really incredible looking color versions of the episodes. Once again, when it came around to the VHS release of this particular story, some of it was only presented as black & white as there was no way to get rid of this rainbow garbage. Technology would soon prevail…. Through the art of black magic this story has been restored. OK, so it’s not black magic but it is just as complicated but truly amazing. Through chroma dot recovery, depending on how a color episode was telerecorded to black & white film in the 1970s, the color may lay dormant in the film itself. Richard Russell wrote the software that made it possible to do this. The color is stored in small dots on the film. This would only work when the episode was telerecorded to black & white and if the notch filter was left off. Out of all the black & white telerecorded Jon Pertwee episodes, only one episode had the notch filter left on (The Mind of Evil Episode One) but with this technology results may vary. If chroma dots are present, it doesn’t automatically mean that we get full color. A ton of work goes into this process but only because there was any color information on the film can we now get a full color version of this story without any rainbow patterning. Success! The overall results are good. I am quite honestly surprised that there is no disclaimer on the packaging explaining that these are vintage recordings and that quality may vary throughout the episodes. On the flip side of that, I am also surprised that there is nothing to proclaim that this story is in full color for the first time! The quality really does vary a lot in the story but there is good reason for that. Episode 1 is the first episode in the Doctor Who archival library to exist on its original 2” master videotape. Everything before that exists only as telerecordings or straight up film recordings. The quality on Episode 1 is stunning. Moving on to Episode 2 and onwards there becomes a mix of grabbing the color from the domestic recording from WNED or chroma dots or possibly both. Episode 5 is quite excellent. The others are just good. I know it sounds like I being critical but in fact, I am honest. I think the best was done with the material. I rather have it this way than in black & white. It’s actually an amazing achievement and everyone involved should be proud. When I was younger, there were a lot of technical things I wanted to see happen with Doctor Who episodes. I always wondered what the original black & white episodes would look like with their original videotape fluid look, VIDfire has shown me. I also wondered what it would be like to be able to watch all the Jon Pertwee episodes in color from start to finish. By the end of next year, I think I will know. That’s down to people who commission and put these DVDs together and a very big thanks to the unofficial Doctor Who Restoration Team who has given this series so much love over the years. As usual with a Doctor Who release, there is a great deal of extras in fact making this a two disc release. I personally prefer extras on these releases that are more archival in nature and I get some of that plus some newly made ones too. Mars Probe 7: Making the Ambassadors of Death: This documentary gives some background on the making of this story but features heavily on Havoc. Havoc is the team of stuntmen who did much of the stunt work for Doctor Who during the UNIT years. It was nice to see some people I have not seen in these documentaries before such as Margaret Hayhoe. It was also interesting to hear about the motorbike accident that happened on location when an ambitious stunt scene was shot. The bike got out of control of one of the stuntmen and went into the camera crew hitting the Director’s Assistant Pauline Silcock. I suppose the producers, editors, and directors of these “making of” features do everything in their power to keep these fresh but I sometimes wish these programs were a little more straightforward and simple. I think the link during this program between the broadcast of The Ambassadors of Death and what was going on with Apollo 13 was tenuous at best. I know these were happening simultaneously. I get what is trying to be done here but it just didn’t work for me. That doesn’t mean I didn’t enjoy the work on this extra. I just prefer simple in presentation. Tomorrow’s Time: The Third Doctor: This ongoing feature is quite good and gives a nice, albeit brief, overview of how a Doctor was perceived by the press at the time. Peter Purves always does a nice job with whatever he is requested to do on these releases and it’s a nice contextual piece for that era though at times it does seem a bit rushed. Trailer: This is a specially made trailer that aired at the end of Doctor Who and the Silurians Episode 7. It was specially made with Jon Pertwee on camera informing the viewers with what is this story is about through him speaking plot points. I have seen this trailer in various forms throughout the years and in variable quality. Originally made in color, only a black & white version exists but just like the story itself, it has been re-colorized. With no color version of the Pertwee on camera bits existing a lot of work has gone into this one extra and I really appreciate it. This trailer is just as cool as the story it is for. Photo Gallery: There is a great collection of photos from this story including some great behind the scenes pictures. The greedy-Greg in me would prefer these as high quality stills that are DVD-ROM material but now I’m being picky. Once again, a ton of work went into this as Mark Ayres re-created music composed by Dudley Simpson for this story to accompany this photo gallery; the original music tapes for this story are long gone. PDF Materials: Radio Times listings. Keep them coming. I wish we would get the Annuals back on these discs too. Production Subtitles: A wealth of material. In fact amazing. Commentaries: On this are Caroline John, Nicholas Courtney, Peter Halliday, Geoffrey Beevers, Michael Ferguson, Terrance Dicks, Derek Ware, Roy Scammell, and Derek Martin. Don’t worry; they don’t all talk at once. In fact, they all come and go throughout the story. For example, Episode 2 is just the stunt folks. This was recorded a while ago as so many of these wonderful people are no longer with us, it is nice to hear them on here. It’s actually really nice. These commentaries are moderated by Toby Hadoke. What I think is missing on this release is some kind of short video about the restoration. On the VHS release back in 2000, there was a very short and sweet look at the various stages this story went through for that release. I think a no-frills short video would have not gone a-miss here. As much as I love the restoration of these stories, I don’t think it is necessary for every release to have one but when one is special like this, it would be nice to have. Maybe it is being saved for the release of The Mind of Evil which is using a lot of similar processes to this story. It just seems so weird that so much went into restoring this story but so little is said about it. This story is released in a standard 2-disc Amary case. The case is a “flipper” meaning that one of the discs are on an hinge inside the case. The cover is one of Lee Binding’s better offerings. It’s straightforward and doesn’t try to be something it’s not. It sells the story pretty well and is not overcrowded. Ever since the US releases started to use the UK covers, they look great. My only minor quibble (which wouldn’t make one difference in sales or anything else) is that I think the logo and title are a little too low on the front cover. There seems to be too much space at the top of the cover. On the back cover its lists extras but only gives durations to the trailer and to the photo gallery. It’s interesting it doesn’t for the other two features. I have waited so long for this story to be out on DVD in full color and I have not been disappointed. I have watched this story from this disc at least 3 times. The only thing I would have liked them to consider was breaking up the episodes across two discs to get a better bit rate. I know people were up in arms when Doctor Who and the Silurians episodes were broken up between 2 discs but I don’t want something for the ease of watching it all on one disc IF it compromises quality. I want these in the best quality possible. Regardless, I love this release and with it we are one more step from having the complete run of Jon Pertwee Doctor Who episodes in color! 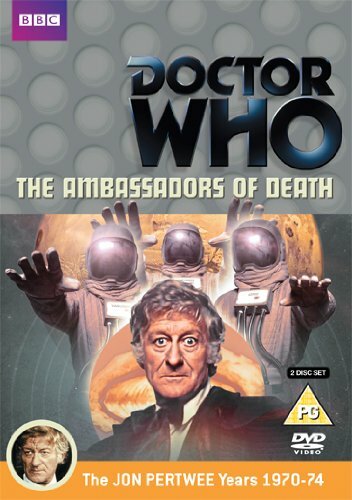 Disc 1: The Ambassadors of Death Episodes 1-7. Commentary & Production Subtitles. Disc 2: Mars Probe 7: The Making of The Ambassadors of Death, Tomorrow’s Times: The Third Doctor, Story Trailer, PDF content. Next week: I have fallen behind with my hugely unpopular series of Bond articles. Maybe I will cut my losses on that. Upcoming reviews include: The Duchess of Duke Street – The Complete Series and Poirot Series 1-6 Blu Ray. Both series are being released by Acorn Media. Wow, an actual Doctor Who article! Good stuff, and I look forward to getting this release. Unfortunately I am so far behind in picking them up that it may be a while. Still, something to look forward to. I can't wait to see your thoughts on Duchess. Thanks! I really enjoyed the disc and it reminded me how much I loved this story. Regarding Duchess, I would have never guessed where this series would take me when I stuck in the first disc. Wow! Great article! I picked up my copy of the DVD last night. I grew up near Syracuse, NY and was very excited when our PBS station got the Pertwee Doctor Who package. I still have my BetaMax copy of this story (in black and white) I taped at the time. I never got the VHS version. Will settle in tonight for a full color treat! Hi CvilleTed! Nice to see you comment on here again! I haven't heard from you since the Missing Episodes article. Thank you for the nice words you said about the review and please come back to let me know what you thought of the DVD and the restoration. Good article Greg. Part way through the article I started hearing Kermit the Frog sing "The Rainbow Connection" the moment I read the Rainbow Connection. Thanks for the nice words Mike. I am sorry that you have that song stuck in your head. Try listening to the theme to The Duchess of Duke Street! That theme will never leave you. Ever! I got this for my birthday last year and I was impressed by the restoration.i couldn't tell which is the VHS from America and which is the chroma dots.the vidFIRE process looks very improved. I hope timeslip can be restored this way.